In the year and a half since the flight of the first manned balloon in 1783, an Italian has flown, a Scot has flown, a woman has flown, even a sheep has flown. But no one has flown from one country to another. John Jeffries, an Englishman, and his pilot, Jean-Pierre Blanchard, a Frenchman, want to be the first. On January 7, 1785, they set out to cross the English Channel to France in a balloon. All seemed to be going fine, until Jeffries decides the balloon looks too fat and adjusts the air valve―how hard could it be? Too bad he drops the wrench over the side of the aerial car. With no way to adjust the valve, the balloon begins to sink. Jeffries and Blanchard throw as much as they can overboard―until there is nothing left, not even their clothes. Luckily, they come up with a clever (and surprising) solution that saves the day. 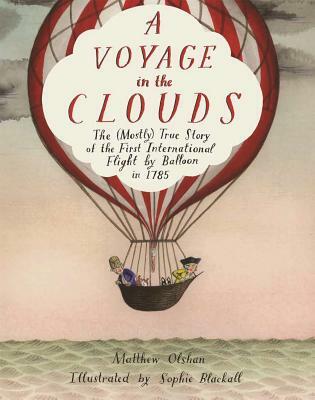 A VOYAGE IN THE CLOUDS is a journey that will keep kids laughing the whole way.